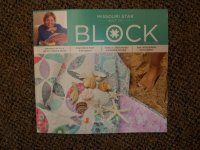 The Jenny Doan BLOCK magazine has arrived. Of course we have the reserved magazines all ready to go. If you would like us to hold one for you, give us a call or send us an e-mail. The fabric for our retreat project is going to be cut today. It is going to be soooo stunning. Beth almost has the pattern finished and we can't wait to get started on the quilt. It will be available in 2 sizes. If you would like to join us for "Summer Pamp" at Wise Guys on June 19 and June 10, give us a call! The cost is $115 and we will sew from 9 AM - 12 midnight on Friday, June 19 and 9 AM - 9 PM on Saturday, June 20. The cost includes 4 meals, classes and use of the facility. We always have a BIG time!